Here we have a fully-functional Italian concerto for Soprano, Alto and Tenor recorders. The Tenor part often doubles the Violas. 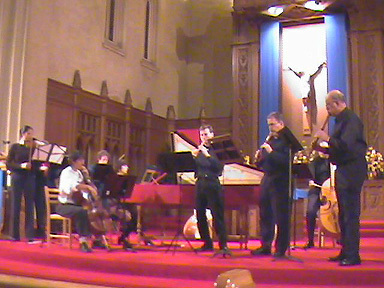 When Baroque Etcetera performed this, we had a bass viol in the continuo, which would also work with a bassoon. The three voices of this concerto are independent voices but act more as a single three-voiced soloist than three separate voices. I really love the funky swingy candences in the third movement. They rock! And if your group can get their quasi-hemiola feel, you'll be a big hit with your audience, especially if you can get the timing perfect with the final "wink" by the recorders before the very last bar of the piece. The structure of the middle movement is intended to be like a continuous cycle of perpetual motion in three melodies, while the strings pluck a constant rhythm. The cadenza should ebb and flow in tempo, something the midi file doesn't really do very well. Here again, all three recorders need to act as one three-voiced soloist, especially with all the ebbing and flowing going on in the cadenza. The finale of this concerto is typical of the Italianate style, with major flourishes in all three parts. This is the movement with the funky cadential figures. Speaking of figures, the continuo line is unfigured (if I were to figure out the figures, it would be another twenty years before it was ready). The way I figure it, an experienced harpsichordist would know what to do from reading the score. The right hand staff is blank, so you can put in there what you like.